The Victoria Hotel is probably the most extensively modernised of the pubs in Port Fairy, these shots were taken before our visit on a showery autumn evening, when things were a bit darker and less condusive to outdoor photography. With several different areas including a quiet front bar where we ended up eating, a sports bar with outdoor area and a high roofed glass walled dining area, which was packed during our visit. 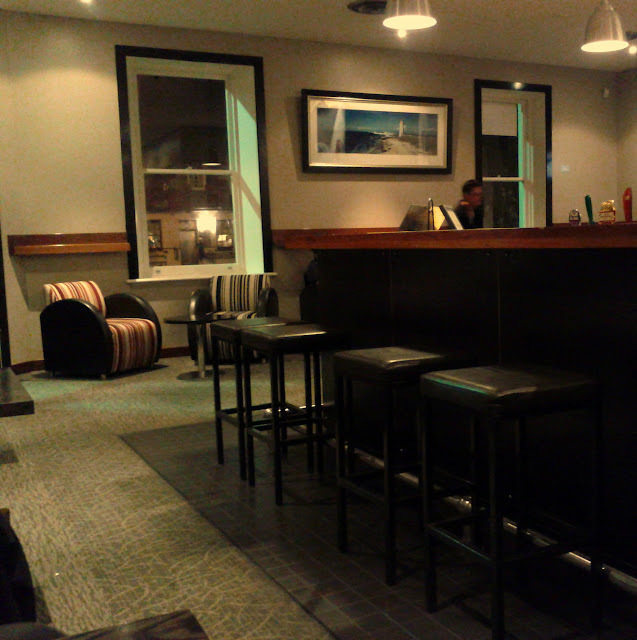 The front lounge bar area is in the original section of the building and was much quieter. The casual dining menu is available all day and there is dinner menu available in the main dining area after 6pm, but we weren't able to try that as the tables were all packed. We started with the Share plate which featured a couple of lovely natural oysters, plenty of well grilled saganaki and two arancini balls, which crunchy on the outside and creamy if a little bland inside. 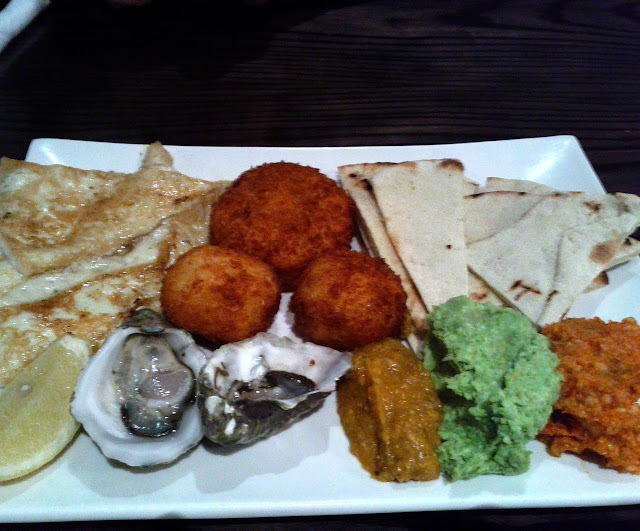 The house made dips veared away from the standard offerings, with a satayish offering that was a little on the sweet side and an interesting pea based purée, unfortunately the bbq'ed leader prawns hadreplaced by a fish cake, which we'd both ended up ordering for our main. 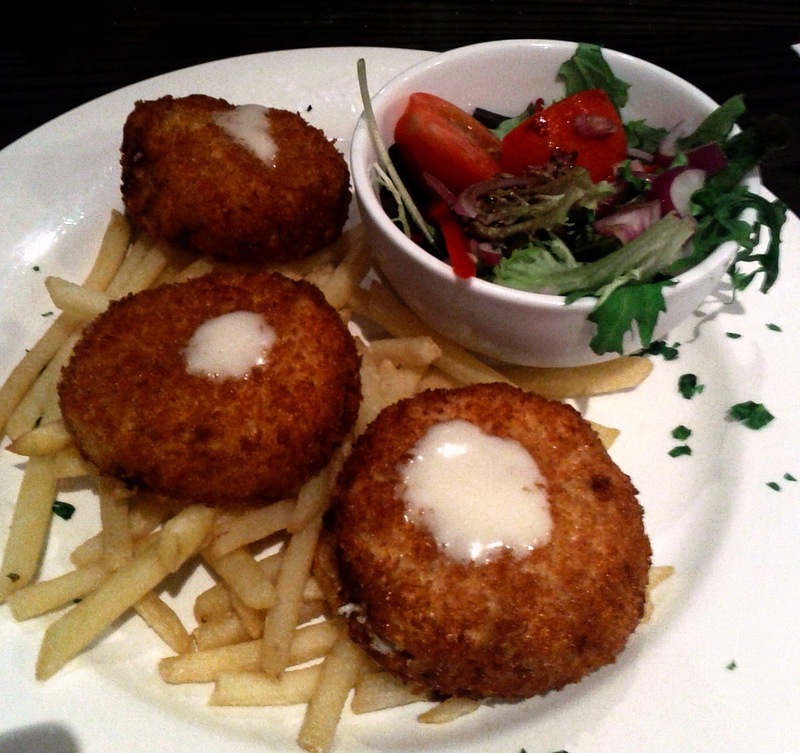 I've always been a big fan of fish cakes, I'm not sure if it's an English thing... The lemon and dill patties on offer here had plenty of salon inside but I didn't notice the herb of citrous flavours. The chips were a little too much in the shoestring style for me, but weren't bad. The salad was fine and fresh, the mayo could have happily been served on the side. The bar staff were all friendly, and given how busy the place was out meals came quickly, I also enjoyed ny Flying Horse brewery 'Dirty Angel' beers from down the road in Warrnambool. Our food bill came to $56.8, which was pretty good value and I'd be interested to try the more extensive menu in the main dining area.